For a first class dining experience while in Cowes, dinner at Mojac’s A La Carte restaurant is a must. Mark and Helen Baldwin are the husband and wife team behind the busy restaurant located at the top of town in Shooters Hill. With over 30 years of experience in the catering industry, proprietor and chef Mark creates traditionally British cuisine prepared and cooked on site from quality local produce. 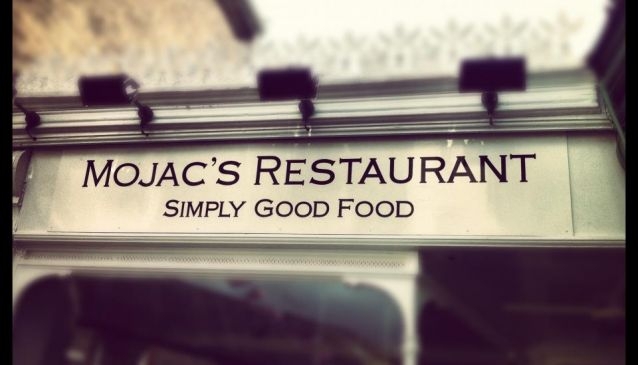 The success of Mojac’s aim to wine, dine and indulge customers in a cosy and relaxed environment is reflected in their recent awards from the independent Good Food Guide, the Wight Good Food Guide and consistently glowing reviews from customers promising to return. Try and time your visit for ‘Ghost Night Supper’, one of many themed nights held throughout the year. The evening includes a three course meal and the chance to hear some infamous tales about the hauntings of Isle of Wight from the renowned local ghost guru Marc Tuckey. Depending on the season and availability, the menu changes on a regular basis with starters from £6, mains from £12 and desserts from £5. Dietary requirements can be catered to, call to discuss beforehand. All sauces and soups are gluten free, with nut-free dishes also available. Walk-ins are welcome but reservations are recommended.